Another edition of mlb.com beat reporter Bill Ladson’s inbox, dated 1/16/12. Man you know I’ve been busy at work if I’ve had this canned and ready to publish for more than a week but couldn’t get online to do so. As always, I write my response before reading his, and sometimes edit questions for clarity. Q: Why are the Nationals wasting time talking to Prince Fielder when they should be signing Ryan Zimmerman to a long-term contract before it is too late? A: *sigh* Why, why, why is it going to be “too late” to sign Ryan Zimmerman to a long term contract if it doesn’t happen right now? Someone please check Cot’s before asking this question. He’s signed through 2013! I don’t believe Prince Fielder has anything to do with Zimmerman; we’re talking about a franchise that has been underspending on payroll by $35-$40 MILLION dollars the past few seasons. People who claim that the Nationals “can’t afford both” Fielder and Zimmerman are expressing unsubstantiated opinions. Ladson thankfully notes the fact that Zimmerman is signed through 2013. Q: What role will Roger Bernadina play on this year’s team? I love the kid’s heart, but the people in power don’t seem so encouraged. A: Hopefully none. Nothing personal against Bernadina, but what more can we learn about the guy at this point? 1000 major league plate appearances, an 81 OPS+. About the only thing he has going for him is that he’s pre-arbitration and is cheap. This team is offensively challenged and needs outfielders who can slug something higher than .350. Ladson thinks he’ll be the 4th outfielder, competing with Mike Cameron for center field. I hope not; can’t we sign a stop-gap right fielder?? Q: Have the Nationals thought about moving Danny Espinosa or Ian Desmond to center field? A: I doubt it. What would that solve? As soon as we moved one to CF, we’ve lost a plus defender in the middle infield with no assurance that they’d be any good in center, and we’d still need to find a solution for whatever position they’ve vacated. We need to find an outfielder who can hit and put him in play. Its that simple. Ladson says nope. Q: I am still a believer in Desmond although his batting average and power numbers declined last year. He is a big, strong kid who can hit 15 home runs and steal 30 bases if he can be more selective at the plate and figure out how opposing pitchers are trying to attack him. What do you see for Desmond in 2012? A: 2012 is make it or break it season for Desmond. Two full time seasons at the plate and he’s regressed each time. You just cannot put a guy out there who’s 20% worse than the MLB average (i.e., an 80 ops+, his figure for the 2011 season) and be successful in the modern game. What do I predict? I think he’ll be similarly poor, will feature 7th or 8th in the order most of the year, and will force the team to look at replacement options starting in the trade season. Ladson thinks Desmond’s late season surge bodes well for 2012; indeed he was great in the last two months of the season. Lets hope he’s right. Q: Assuming the Nats will not sign Fielder, would it be a good idea to sign an outfielder like Johnny Damon? Can you see him as a fit in Johnson’s lineup? A: No; Damon is limited to playing LF in an easy-to-defend ball park (like Fenway) or a DH at this point. His outfield arm is beyond weak. He can hit though; but he has no position on this team. If we’re going to go with Jayson Werth in CF, I think we should sign one of the good hitters still available in the RF market. Ladson agrees with me that Damon is an AL-only player now. Q: If the Nats acquire Fielder, would it be best for Adam LaRoche to be traded for a bench player who might start once a week? A: Sure, if they could trade him. Problem is, if LaRoche needs to be traded there’s not an awful lot of teams that would be interested. 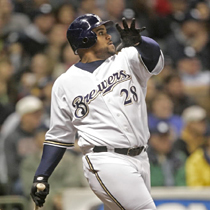 See my post about the Prince Fielder market; maybe we could trade him to a team like Baltimore or Houston, but they’re not going to give us much in return, and we’ll be forced to pay most of his salary in make-weight. 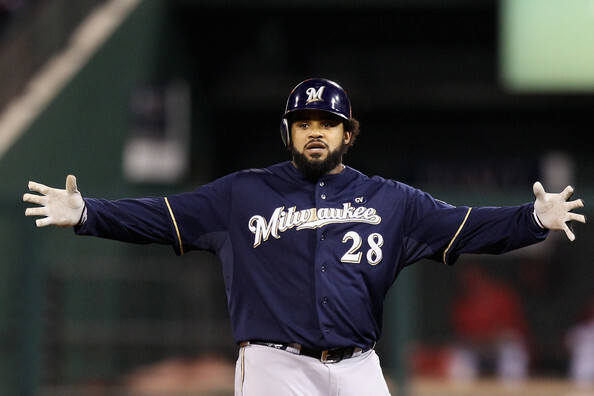 If we sign Fielder, you might as well just release him. Ladson points out that we’re not even sure LaRoche is healthy at this point. Q: In all the talk about 2012, I haven’t heard a word about the status of catcher Ivan Rodriguez and right-hander Livan Hernandez. What are the Nats’ plans for those two fan favorites? A: The wise fan would correctly assume that the lack of discussion about both Hernandez and Rodriguez would indicate that they are no longer in the team’s plans. Because they’re not. Both guys are probably out of baseball after 2011, given the calibre of players that remain unsigned so far this off season. I’m sorry to say: Livan’s precipitous decline in performance in the latter half of 2011 eliminated his candidacy for the 2012 rotation. And Rodriguez may be a great historical player and first rounder, but he hit .218 last season. Ladson thankfully agrees. John Sickels does in-depth system reviews, but allows his readers to pipe in about the prospects down on the farm. Here’s the discussion on the Nats, which (as is apt to happen) devolved into arguments about Bryce Harper. Still, lots of the usual suspects piped up and offered opinions. Here’s a link to his preliminary list of Nats prospects. In case you havn’t seen enough scouting reports on our precocious star, here’s another from the blog prospectjunkies.com. I will say it was refreshing to see this author go out of his way to dispell the whole “Harper is a brat” storyline that most lazy sportswriters pen, without having ever interviewed or even *seen* the guy. 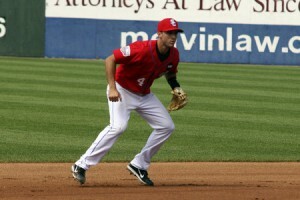 I hope this isn’t our starting CF for 2012; Nats sign Mike Cameron to a minor league contract. I actually don’t mind this deal; yes he’s old and yes his production slipped badly in 2011, but he’s still a high-end defensive player. Maybe he’s just a cheaper version of Rick Ankiel. Odds are, as posted elsewhere, that Cameron is a half-season option just holding court until Harper is promoted sometime in June. Works for me. Hmm. 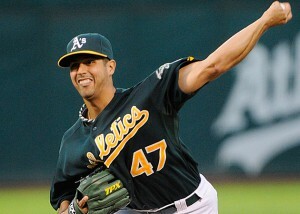 Reports from Ken Rosenthal that the team is “pushing hard” for Gio Gonzalez, offering Billy Beane a “4 for 1” deal. Not sure I like hearing that; while he’s got decent stats two years running, there’s some chinks in that armor. He lead the league in walks last year and gives them up at nearly a walk every other inning. His ERA jumps nearly a point when he pitches away from the friendly confines of Oakland’s pitcher-friendly stadium. He’s not an “Ace.” What four players are we talking about giving up? If this is anything like the Mat Latos deal, it probably would be something like Detwiler, Norris, a major league arm and a lower minor league arm. First Reports on the winning Yu Darvish bid? $48M. No, wait, then it was even higher than Dice-K’s bid. I privately thought he’d eclipse Daisuke Matsuzaka‘s record of $51M (and change) from 2005. Another nugget from this article; Darvish wants a 5yr/$75M contract. That’s $120M+ for this guy. Does anyone still want to argue that he’s worth $120M, when the absolute best FA pitcher purchase in recent years (Cliff Lee) himself got 5yrs/$120M guaranteed from Philadelphia? Who won the Darvish sweepstakes? First thought to be Toronto, then Texas. On 12/20 we were confirmed: Texas won with a $51.7M bid. The AL West is turning into a shootout. Breaking news over the weekend: Cincinnati gets Mat Latos for a package of prospects that includes their uber rising star Yonder Alonso, another 1st rounder in Yasmani Grandal and former ace-pretender Edinson Volquez. That’s an awful lot for a guy who, while certainly is “good,” isn’t among the elite pitchers of this league. That seems like more than what Zack Greinke fetched, and he as a Cy Young award to his credit. It also begs the question; why does San Diego need Alonso? They already traded for a top-end 1B prospect, Anthony Rizzo. Alonso was blocked in Cincinnati by Joey Votto and was clearly on the trading block, but San Diego is a curious spot. Oh I see now: he’s officially listed as a left fielder now. Except that scouts openly scoff at his abilities to play anywhere but 1b or DH. The Padres can always put together a competent pitching rotation by virtue of their park; if some of these hitters pan out they could be a very good team, quickly. Meanwhile Cincinnati gets a good pitcher who hopefully wasn’t under-exposed by pitching in the cavern in San Diego but who most say is a legit front-of-the-rotation ace. Update: now we’re hearing that Rizzo is in play possibly for Matt Garza. That’s probably Theo Epstein trying to get his boy back. An excellent take at Grantland from Jonah Keri, another favored writer, on Steroid use in baseball, inspired in the post Ryan Braun mania. As it has turned out, Braun’s case isn’t about Steroids, but he does dispute the notion frequently posted on the internet that “no positive test has ever been appealed successfully.” In reality, according to both players and well-connected writers, no “leaked” positive test has ever been appealed, and that initial positives have been overturned on more than a few occasions. Here’s a player who says he successfully appealed a positive test himself. He also links to very interesting articles on testosterone and false positives, one of which (If i’m reading it correctly) notes that about 1 in 4 positive tests is actually a false positive. I can’t believe any official test is that inaccurate, so perhaps its either old technology or i’m mis-interpreting the story. Subsequent reports show that Braun’s test was from medication taken for a “personal issue.” Sounds like Viagra, doesn’t it? Another takeaway from Keri’s article is another pet peeve of mine; the notion that Matt Kemp was a “more worthy” MVP candidate than Braun but that Braun won the award because “his teammates were better.” That’s one take on the award, IF you interpret the “MVP” to be given to the “best player” in a particular year. But that’s not the definition of “Most Valuable Player” that most writers adhere to. Simply put, how can you be the “Most Valuable player” to your team if your team stinks? If your team already has a losing record, and the star player wasn’t there, wouldn’t that team just have a WORSE losing record? To me, that’s the essence of the MVP argument; you simply cannot be the most valuable player on a bad team, unless your season is so historically amazing that it stands out on its own merit. If we want to “invent” a new award, say the “Cy Young” of hitters (almost an uber “Silver Slugger”) so that we can properly award a guy like Kemp, I’d be for it absolutely. In fact, it would pretty much end these ridiculous arguments that will only continue to get louder as more and more stat-heads who never actually watch games but just interpret advanced statistical tables on websites as if baseball players were robots playing in a nil-gravity vacuum gain admittance to the BBWAA and start voting on these awards themselves. Yet another excellent Grantland.com article, this time analyzing whether or not the Economics of Moneyball still exist. After this article published, I saw some criticisms of the statistics used on more stat-heavy blogs like Fangraphs. Not sure why; the article makes sense to me. I sometimes take issue with Craig Calcaterra‘s stuff on Hardballtalk, but his opinion on ESPN Legal Analyst Lester Munson‘s love affair with the abject failure of the Barry Bonds case is spot on for me. Bonds was convicted of one really shaky obstruction of justice count after years and MILLIONS of dollars of expenses, and was sentenced to 30 days of home confinement. The prosecutors who led this monstrosity need to be fired, frankly. Ugh. Bill Conlan of the Philadelphia Daily News, a hall of fame baseball writer, resigns ahead of child molestation charges being filed. Interestingly, it is the rival Philly newspaper, the Philadelphia Inquirer, filing the charges. I like Grantland, and I like stuff that Chuck Klosterman writes. Here, he writes about the “Triangle Offense” that we’ve heard so much about from Phil Jackson during his time with the Bulls and Lakers. My takeaway; the Triangle is dying out because (according to Jackson) the league is dominated by me-first scorers (whether they be slash and burn or 3-point specialists) and because the Triangle is considered really complex. Kobe Bryant‘s wife is leaving him, reportedly because she caught him cheating. Really?? What, that whole incident in Colorado wasn’t evidence enough? In case you somehow missed the front page of cnnsi.com this week, yet another example of the absolute hypocritical nature of the NCAA is on display once again: a former St. Joseph’s basketball player is being held hostage by an (apparently) petulant basketball coach who refuses to grant his waiver to play for another school. Coaches can change schools like they’re changing suits, but if a player changes they have to get approvals from their releasing school (a conflict of interest if there ever was one) and approval from the NCAA, AND then have to give up a year of eligibility. How is this possibly fair? Coaches can coach for 50 years and don’t lose any eligibility; players can only play for four (five if they red-shirt) but have to give up 25% of that time if a situation isn’t right for them. Every time I read something about college athletics like this (or the UKentucky/Oliver case, or the Colorado WR/snowboarder case, or the entire player images case) I’m more and more infuriated and hope that the organization has to face congressional review. More links on the topic: lawsuit threatened. Possibly “the other side” to the story here. There’s other interesting links to twitter comments and blog op-ed pieces throughout. Another opinion here. I hope its as a 4th outfielder: Nats reportedly interested in Mike Cameron. Hey guys, we can get Brian Bixler back! DC-area native Joe Saunders was non-tendered by the Diamondbacks after failing to reach a multi-year deal. There were plenty of other non-tenders to talk about, but the West Springfield graduate immediately becomes a rather high-end FA starting pitcher when compared to the rest of the market. I don’t think he’s worth pursuing necessarily; he isn’t going to give us anything that we probably couldn’t expect to get out of Ross Detwiler at a fraction of the cost, and perhaps this is just a negotiating ploy by the Arizona GM. But its definitely fair to say that his arbitration cost would have probably been more than his actual worth on an annual salary basis. The Yu Darvish deadline passed on 5pm Wednesday, and all we know is that someone actually bid, and that there were a number of serious bidders. The NPB has four days to formally “accept” the offer, so will not know til next tuesday who “won.” I heard on SportsTalk 980 that the Nationals did not submit a bid, and here’s Adam Kilgore confirming in print. I’ve posted my opinion on Darvish in the past; i’m sure he’s talented, but don’t think he’s a 9-figure risk. Unsubstantiated early rumors list the Toronto Blue Jays as the posting winners. Good for Josh Willingham, signing a 3yr deal in Minnesota. Yes we could have used his offense in 2011. Willingham’s 2011 bWAR? 1.8 hitting in a horribly bad pitcher’s stadium. The players we got for him? Henry Rodriguez‘s 0.2 and Corey Brown‘s 0 (and subsequent removal from the 40-man roster). That was a good piece of business! I kind of agree with Phil Wood‘s take on Ryan Braun‘s positive test, as printed here. If a player has been tested again and again, and then (say) gets a test mixed up or hits a false positive, and that test is leaked to the world, wouldn’t you be pretty pissed as well? I’m not saying that’s what happened here (since I have no involvement whatsoever), but such a scenario would play out pretty unfairly to the athlete in question. One can only hope that the “insanely high” levels of testosterone were either a testing mistake or a flawed test. Or possibly that Braun was surprised by the timing of the test and was doing what Victor Conte describes as a “truck sized loop hole” in the baseball drug testing. This story cracks me up: Derek Jeter sends the same “break-up present” consisting of a gift-basket with a hand-signed baseball to all his “conquests.” How did we find this out? Because he had a repeat hookup and apparently forgot that he had already sent one to her. Oops. Here’s the question: how do these women certify the signed baseball? Does it also come with a certificate of authenticity? The verb “Tebowing” is now being recognized as an official word. At least its not ebonics. 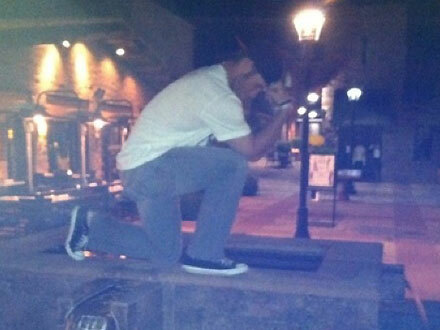 At least not everyone is taking this thing seriously; see here for a fantastic new Tebowing-themed beer label. Thank god for this clause in the new CBA: players are going to be banned from getting corporate logo tattoos. Its too bad; I’m pretty sure I just heard that Stephen Strasburg is getting the Dairy Queen logo tattooed on the small of his back, tramp-stamp style. MLB Nationals beat reporter Bill Ladson doesn’t do mailboxes that frequently, but when he does I’m sometimes intrigued by his answers. Lets see how i’d have answered the questions he took in his latest mailbag. As always, I read the question and answer it myself prior to reading his answer. A: I like Danny Espinosa and was a fan of his even before he started his 2011 rookie-of-the-year campaign. A question though: does Espinosa even feature as a typical 5-tool player? Power (yes), Average? (not yet … despite his BABIP being a bit low he’s only hitting in the .240s), but perhaps in the future. Speed? 12 Stolen bases on pace for about 20. Defense? by all accounts yes. Arm? Definitely. So, he’s pretty durn complete. But, he’s got exactly 3/4 of one pro season under his belt. A lot has to happen before we start comparing him to one of the better players in the last 20 years (Vladimir Guerrero). Ladson says he IS a 5-tool player, and that he’s the best defensive 2nd baseman in baseball right now. Heady statements. Here’s a list of Uzr/150 ratings for 2nd basemen right now; Espinosa is 5th behind some pretty good defensive players. Will he stay at 2nd base long enough to gain consideration or take over at short? See below. Q: With Mike Cameron traded to the Marlins, do you see the Nationals making a move to get someone like Cameron before the non-waiver Trade Deadline? A: Mike Rizzo keeps talking about how he wants a center fielder. BJ Upton and Michael Bourn are names that keep popping up. But at what point does the team realize it may have a great future center fielder in Bryce Harper and just wait it out? I wouldn’t want Cameron, an aging player living on his defensive reputation of yesteryear. Ladson specifically mentions both Upton and Bourn, stating that the Nats are not interested in aging vets. Q: What is Ian Desmond’s future with the team? 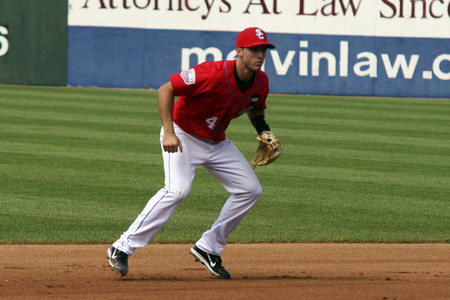 Steve Lombardozzi seems like he could be a fit as a leadoff hitter sooner rather than later. Problem is, he plays second base. Could Desi move to left field, or is it more likely he goes to another ballclub? His numbers offensively have not been good. A: Great question. Ian Desmond has clearly taken a step backwards offensively just at the same time that he’s finally taken a step forward defensively. What should the team do? Live with a plus defender (Desmond believe it or not has a positive Uzr/150 this year, putting him in the upper half of defensive short stops) and his crummy bat? Or try to improve? I think the answer may eventually be to transition Desmond to a different role if he can’t be more consistent at the plate. I’m not sure Steve Lombardozzi is the answer (he very well may be; i’ve advocated in the past for this exact same move) until he proves he can hit at AAA and proves he can hit in the majors. But we also have Anthony Rendon in the wings and may have to find a position for him as well. Its a good problem to have; too many good players and not enough spots. Ladson thinks Desmond is trade bait and is coveted by several teams; we may get our answer in the off-season. Q: With Michael Morse doing so well at first base, is there any chance they might try and use LaRoche as trade bait? A: Another great question. 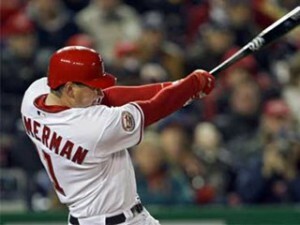 The Nats do have some interesting story lines facing them as they go into 2011. Morse has been a revelation and will be a key part of the team in 2012. LaRoche is signed and is a 25 homer/100rbi guy with plus defense at first, so its hard to believe we’ll sell low on him and dump him this off season. What would he bring in trade return? Almost nothing. My guess is that Morse moves back to left, we flip Nix into a reliever or something, and re-install LaRoche at first. Ladson Agrees. Q: I saw recently that Chad Cordero retired. I know he left Washington with some resentment toward the front office, but is there any chance the two sides can bury the hatchet and honor Chad with some sort of ceremony thanking him for his contributions? He was a fan favorite who gave everything he had while wearing the curly W. He certainly deserves it. A: Any resentment Cordero had towards this franchise should have died the day Bowden was fired. But, who knows, he could have blamed the owners for the actions of its employees. Without dishonoring the guy too much, how much of an impact did he really have here? You can argue that Cordero was a flash in the pan, an over-rated player in a position (closer) that is fungible and more or less replaceable with most any bullpen arm. He had a fantastic season the year the team moved here in 2005, and never came close to replicating it before getting hurt. We spent most of the 2007 season talking about trading the guy. It’d be like honoring Vinny Castillo in some ways. Ladson agrees, and says we should think about honoring Frank Robinson first. Fair enough, but why exactly does this team “need” to honor anybody from the past few years? What did Frank Robinson do for this team except guide it to consecutive last place finishes? Q: Do you see the Nationals moving Jayson Werth to the cleanup spot? We know how good Morse and Laynce Nix are, but chances are opposing teams will walk Ryan Zimmerman if those two are behind him. A: I’m not sure what games this questioner is watching this year, but perhaps this guy has not seen that a) Werth is struggling mightily, b) Morse is hitting the ball lights out, and c) Nix is hitting a heck of a lot better than the average guy. You set your lineup so that you’re not batting 5 right-handed guys in a row but also with a mind towards the roles and capabilities of the players. Werth, Morse and Zimmerman are all right handed guys and should only be put together if you’re facing a lefty. Nix is a great way to break that up but his lefty-lefty splits aren’t that great. What would be really great is if LaRoche was healthy and producing and in the mix for 3-4-5-6 as well, or if Espinosa becomes the power hitting force that he could be and continues to be a basher in the 2-hole. Ladson says Werth may move back to #5 but he’s no cleanup hitter. Q: When will Bryce Harper get promoted to the big leagues? A: Target Mid June 2012. I think maybe the team gets a wild hair and calls him up this september for some cheap box office gate days. And you can’t blame them; he’s already on the 40-man roster after all. But any days he plays here in september delay the days he needs to sit in the minors so as to avoid super-2 status. Besides, Rizzo has repeatedly said he’s not coming up in 2011. Btw, I don’t believe Harper’s current struggles once promoted to AA mean much. He should have gone to high-a but understand why he skipped Potomac’s ridiculously bad field. He’ll pick it back up and he’ll hit .300 his final month of AA. Ladson didn’t really answer, just saying that Harper won’t make it up this year.